I think you had fuel starvation, not carb ice. * Rotax engines are very resistant to carb ice. I have flow my CT for five years, and have not seen carb ice, not even once. This include flights all across the USA in all kinds of conditions with temps from 0°F to 100°F+ and all kinds of humidity conditions. Carb ice is possible, but very rare. The most common ice conditions for us are around 60°F OAT and 90% humidity or higher. What were the conditions during the flight in question? * You have confirmed that there was an empty fuel tank, which puts you at risk for starvation. * Your statement "I got the confirmation that one empty tank will not cause gas starvation" is not really correct. An empty tank will not cause starvation in itself, but if one tank is empty and the other partially full (the condition on the flight in question) AND you fly uncoordinated (very common in a CT), it ABSOLUTELY can result in starvation. Ask Buckaroo, he had an off-airport landing in a field very soon after getting his CTSW, due precisely to this. As Roger said, this has been beat to death numerous times in this forum. I have said numerous times that the safest course of action is to never run a tank empty in the CT. Balance the fuel tanks in flight with rudder trim to keep them roughly even, or at least with both showing fuel in the sight tubes, and you will *never* have this kind of starvation issue. If you do that, no matter what flight attitude you are in there will always be fuel at one or the other fuel pickup. The CT fuel system is "quirky" but a piece of cake to manage. Never check just one sight tube, always check both. Balance them out if you don't see fuel in one. If you come away from this experience saying "well it's just carb ice..." and don't takes steps to better manage your CT's fuel, I'd bet that we'll be reading a thread on here about another similar incident down the road. Look back in the forum history, you'll find numerous similar incidents, all fuel related. In fact I'm sure they have happened, but I'm struggling to recall any engine out resulting in an off-airport landing or crash in a CT that didn't involve fuel mismanagement in a CT. Thus endeth the sermon, ignore it at thy peril. With the left tank still empty, open the gascolator drain and see if you get normal fuel flow. If not, you have something wrong in the fuel path from the right tank to the engine -- pinched hose, debris in the hose, clogged wing root strainer -- something. If you're already put fuel in the left tank, open the gascolator drain and drain the fuel back into your gas cans. If you only see the fuel level going down in the left tank, keep draining until all the fuel is gone from the left. If the fuel then stops and there is still fuel in the right, again you have a right side fuel path issue. Actually, they are dirt cheap with respect to the amount of development hours invested divided by the number sold... in fact, the project is in reality a labor of love. R&D is hugely expensive. My hat's off to you Skunk for creating/making them. I am waiting to see what they look like installed. I will buy a pair too if they are what I think they are. I have found, one major obstacle to overcome, in learning to land the CT, is to avoid “over controlling.” That is . . putting too much correction in. Over controlling leads to ballooning, especially if too much energy (airspeed) is carried into the landing flare. Pitch corrections should be smooth and deliberate, but not excessive. Perhaps Eric can weigh in on this. What many are missing here is prop pitch and WOT rpm. prop pitch plays a tremendous part here. If you're only pitched to get 5300-5400 rpm WOT then one that is pitched at 5600-5650 will walk away. Trimming properly is another consideration. Cross controlling even a little slows things down. It may be small enough you don't even notice. Flap settings can be different from plane to plane. Instruments don't always tell the truth. I wouldn't worry about a few knots of speed and just enjoy the flying experience. Kent is being all humble... I took a vid of him landing at Woodstock (CT... home of Flight Design USA)... recently... The Woodstock runway is 2,200' long and it is exposed on a hill, which is code for these parts as having squirrely winds. His approach and landing were perfect ! I hope he puts the vid up for people to see on Youtube... I don't know how to do it nor do I have a Youtube page. Kent is a great guy and a pilots' pilot... he inspired me to tackle a couple of next frontiers in the plane. The first was a solo exit out of a Class D airport. The tower didn't ask me to call them, so I guess I did ok... The second was just yesterday... a solo landing on a short runway (Goodspeed Airport along the CT river @ 2,100 feet) with 30 degrees flaps... felt great ! Had tons of room to spare, felt like I could land in a parking lot with this new found skill. The 30 degrees flaps option is unbelievably helpful in short runway situations. PS... a great coffee shop is within walking distance of the airport... so here is the proof (below) that I made it... Finally, I was invited to fly with a group of planes to First Flight in N. Carolina... in about 6 weeks. I don't think I'm ready to do it myself. Need some Flight Following practice, etc. Plan would be to fly over the NYC Class B space... we'll see. Best in class photos... and glad you are ok Ed. All light sports are 'harder to land' because of their light weight. 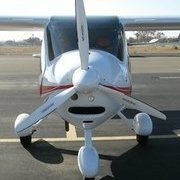 Very light aircraft are more effected by wind shear and they have minimal kinetic energy in storage for stability. The CT is easier than it might be if it was a tailgater. For a light sport the CT is a low drag design and harder to land than many light sports. Hi ibjet, The bike sits quite securely in the footwell and is strapped down really tightly using the seat belts. For some reason which I haven't worked out yet, the belts don't come loose when securing the bike; they are as tight when I land as when I started. But when a person is sitting in the seat, they always seem to work loose 🤔. I first flew this canyon, 1 mile below the rim in my home built that sported 50hp! In the CT its a different ballgame with far less room for canyon exits. The view is of the east rim of McGee Creek Canyon. Jacques, that’s a pretty old document, and I think more is known now. The flutter problems (including mine) seem to be a result of two factors: 1) a full span stabilator anti-servo (trim) tab 2) inadequate structural stiffening forward of the tab hinge line I know of mine and one other CT that had the flutter issue. I had extensive discussions with the other pilot, as well as Tom Peghiny at FD USA, and I have a good handle on this problem. The other affected pilot told me he thinks the problem originates with the swirling slipstream fromthe prop around the airframe, which sets up an airflow that pushes down on one rear corner if the stab, and up on the other one. Add to this the pulsing from the individual prop blades, and you have a high frequency pulsing moment in opposite, complimentary forces on the stab. I think this is a good theory. Most CTSWs, especially later ones, have a bulkhead wall just ahead of the tab hinge line, that provides a large amount of stiffness. Early airplanes, and a few later ones like mine, didn’t have this reinforcement. That allowed the forces describes above to flex the stab at high speed in a fluttering manner. I actually think the movement in my case was better describes as “pre-flutter vibration” that was not terribly violent, but definitely noticeable. In my case this occurred just past 120kt indicated at 2000-3000ft. The fix in both airplanes was to send the stab back to the factory and have the missing bulkhead added into the stab. Since then I have taken the airplane to 140kt+ indicated several times without issue. But I am wary of pushing beyond Vne or even close to Vne for extended periods. There is no need for it and I’d rather be kind to the airplane and make sure it’s kind to me in return. BTW, I have no concerns or hesitation about the safety of the airplane, and would not hesitate to fly it aggressively throughout the published limits of the airframe (and have done so). Just a personal preference for me: I have preferred clear tape because I can still see behind it for fuel or the aileron control rod. I can use clear tape over the fuel site tube area.